Off-line bypass oil cleaners for high flow rates and for large tank volumes. Based on the SS-series filter housings. Very large oil volumes up to 50.000 litres. Effectively removes all the particles that are usually very difficult to remove with conventional filters and performs a total cleaning of the oil by removing solid particles, absorbing water and eliminating sludge and other oil oxidation residues. All systems are fully equipped and come with a washable metal suction filter, control gauges, a control panel with on/off switch and a drain tap. Standard units have a flow range from 6 lit/min up to >60 lit/min, and can be suitable for very large oil volumes (>50.000 litres). Optional equipment: timer, automatic drain function, Quicktoron air removal. 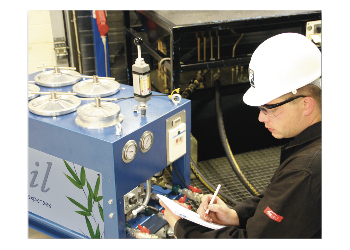 Lube systems and high viscosity systems. Quicktoron air bubble remover - improves and increases filtration efficiency and accuracy. Automatic drain function - element change without oil spill. Pre-heaters in case of high viscosity oil.